We hear in the news over and over and over again how much of our debt China owns. How many times has someone said that China is our banker? This of course implies a sense of vulnerability to the Chinese: What happens when they stop buying our debt and start selling, or when they finally get exasperated with our irresponsible inflationary monetary policy and yank their rug out from under our dollar? Some have countered, however, that such a sell-off of our debt is very unlikely to happen, with Keith Bradsher of the New York Times being one such detractor. His reason? 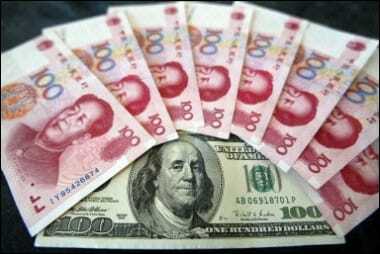 The Chinese are doing much the same things to their own currency, the renminbi. And in fact, they may be doing even worse to it. Bradsher outlines China’s huge ramping up of money supply, especially in the last 10 years. He says that Zhou Xiaochuan, governor of the People’s Bank of China, puts Ben Bernanke’s destructive monetary policies to shame. Consider that since 2006, China’s money supply has tripled. Tripled! With much of this liquidity in China going into assets like real estate, Bradsher illustrates the human side to a very familiar looking a real estate bubble that has seen prices double every few years: Property owners are understandably thrilled, but with wages not keeping up with these surging costs, what of those seeking a place to live? The imbalance is unsustainable, as we Americans have figured out by now (or should have). It’s all a part of the worldwide currency race to the bottom, with nations going up against each other to weaken their currencies as fast as possible so that their exports become cheaper and they’re able to sell more. But of course this only encourages reciprocation from other countries, and so we all take turns being the least valuable currency in this twisted little game of money printing. The ability to manipulate an economy this way, rather than actually focusing on better outputs, is what comes about when currency is based on nothing. In other words, without a commodity-backing (like gold) to constrain a nation from simply printing more paper money, printing is what they eventually do. The urge is irresistible and the rewards are immediate and tangible. But what’s the damage of playing this twisted little game? It’s long-term and underlying. Eventually, the currency returns to its intrinsic paper value – zero. When…??? Fiat currencies – that is, currencies backed by nothing – have a life expectancy. The average is just 27 years. The greenback, in its current pure fiat state, is just over 42 years old, so it has already had a good, solid run. But it is long overdue for a retooling of some kind. And that’s not us making some outlandish prediction – that’s simple historical fact, merely something we should expect based on past events and current dynamics. So why does that sound irrational to so many people? Things have been coming apart at the seams for some time now – all you have to do is look. Here’s the unfortunate reality of what’s to come for many (hopefully not you): You work hard all your life and build up a store of savings in fiat currency. It’s the “wise and frugal” advice you’ve received since school. But then the currency goes defunct. What about all that “value” you saved? For all intents and purposes, it has vanished. Here’s the fortunate reality for the few who make out well when currencies go defunct: They’ve seen what’s coming and have traded in their currency for tangible goods, whether it be real estate, artwork, jewelry, furniture or (of course) gold. Anything but currency – the exact opposite of all the “wise and frugal” advice you always heard. It is not fair that savers will be punished, but when a currency collapses, that’s precisely what happens. Continuing to spend and borrow is something fiat currencies push us to do, or risk losing it all. Currency crises are messy. Fortunes are made and lost on them. The markets go chaotic. But amid the frenzied chaos, there is one constant, one historical truth: A fall back to the tried-and-true consistency of precious metals. That’s the way it has been for thousands of years. So ask yourself: Why would now be different? You can save yourself from who-knows-what by having the fall back already in your portfolio. Call us to get started – or click here to get a free gold investment kit.